They like to keep you well fed on Viking cruises. After our trip to Auvers we were met with this amazing hot chocolate with Baileys Irish Cream. Deliciousness. And I discovered the endless supply of meringues at the snack station. Yummy crispy bits of sugary fluff Aka diabetic coma makers. Lol. I meant to tape the dried flower in my book. Turns out it’s illegal like my sycamore leaf. Now down the garbage disposal into the septic tank so no diseases could be spread. 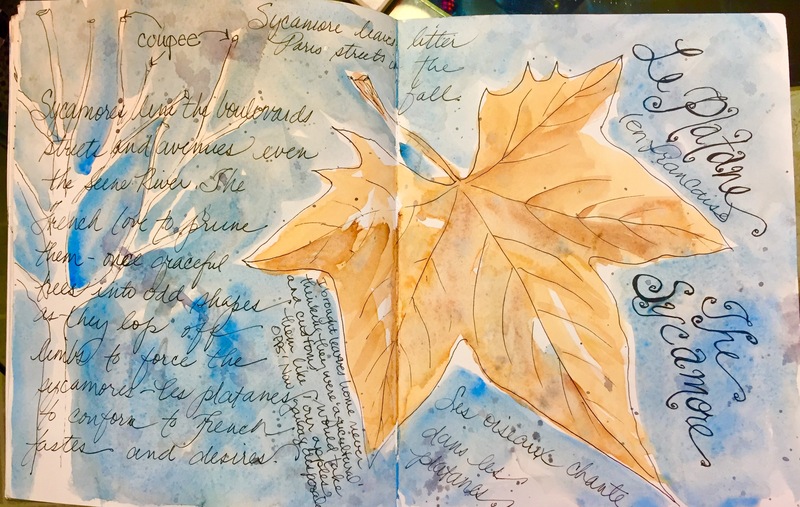 I like to collect leaves and feathers for my journals. Note to self. NOT WHEN ABROAD!!! Colors used. Winsor yellow background. Inathrodone blue and burnt umber. Flower alizarin, inathrodone, and hookers green. 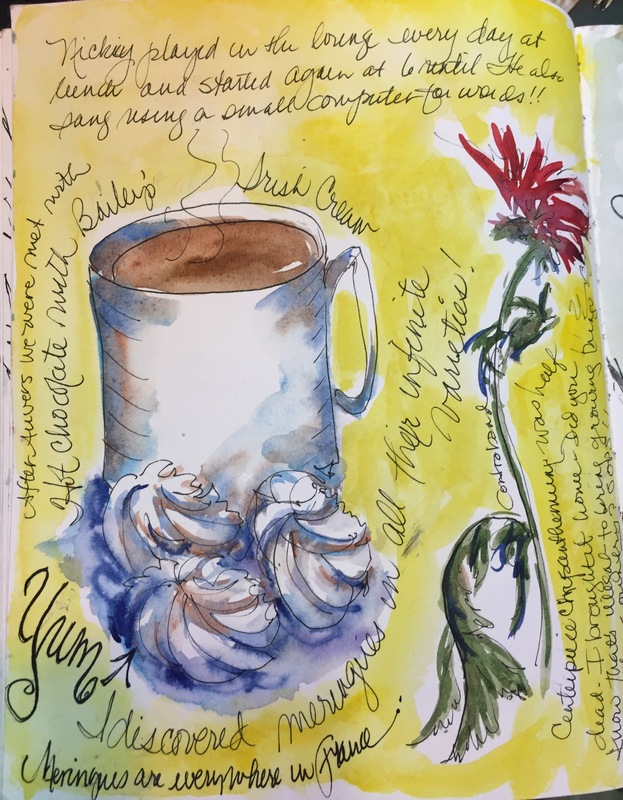 Strathmore 500 mixed media journal, Konrad Noodler, carbon platinum black ink. 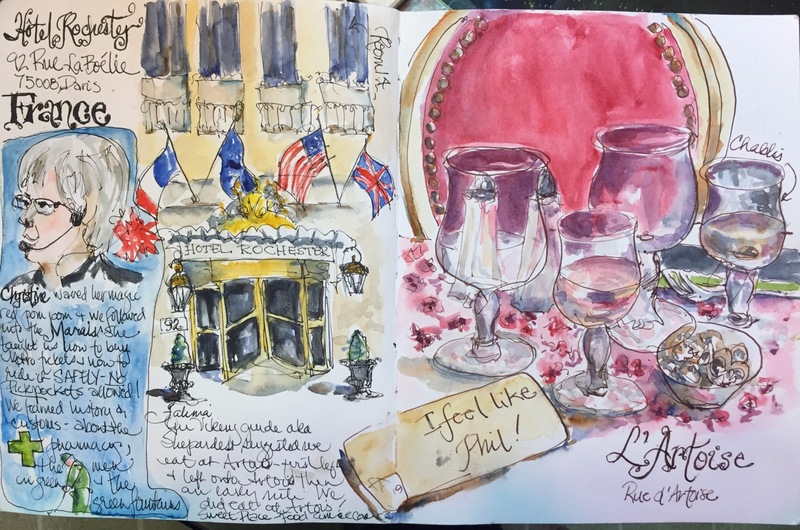 In the Viking Pride lounge moored at the Quai Greinelle near the Eiffel Tower after lunch when I should have been resting for more fun all I could do was draw draw draw. 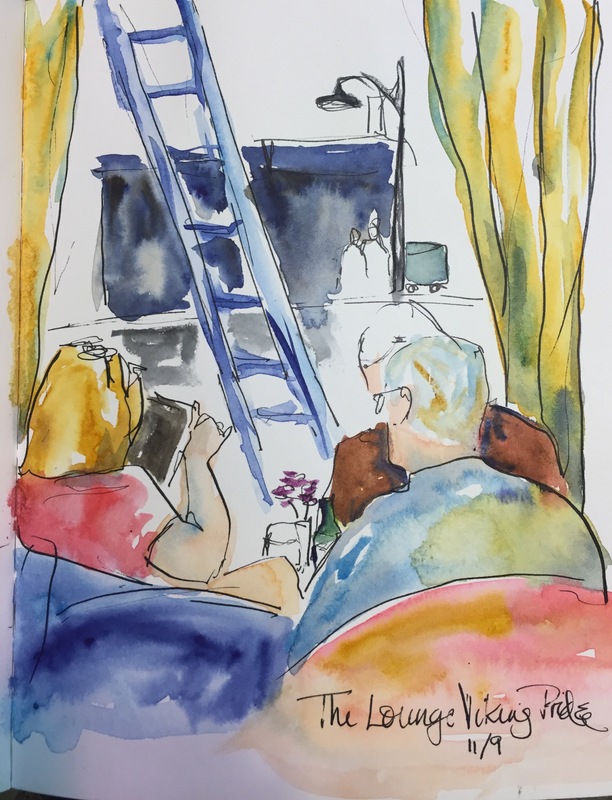 This is our new friends Jane and her husband Dennis though we didn’t know them when I drew them. 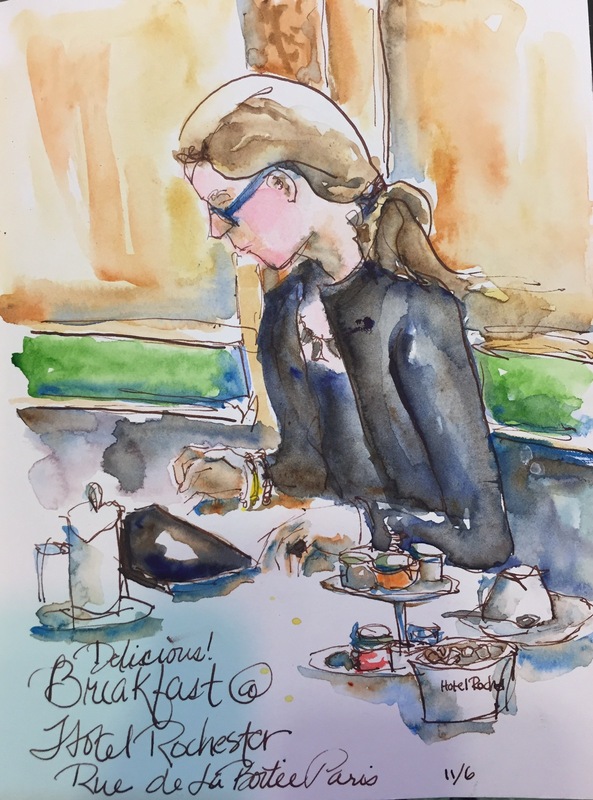 Really like all the runny wet on wet color in this sketch. Colors used. French ochre w Quin coral for skin cobalt shadows. Hair French ochre and burnt sienna. Grey hair cerulean, burnt sienna. Black inathrodone blue and burnt umber. Chair alizarin and French ochre. 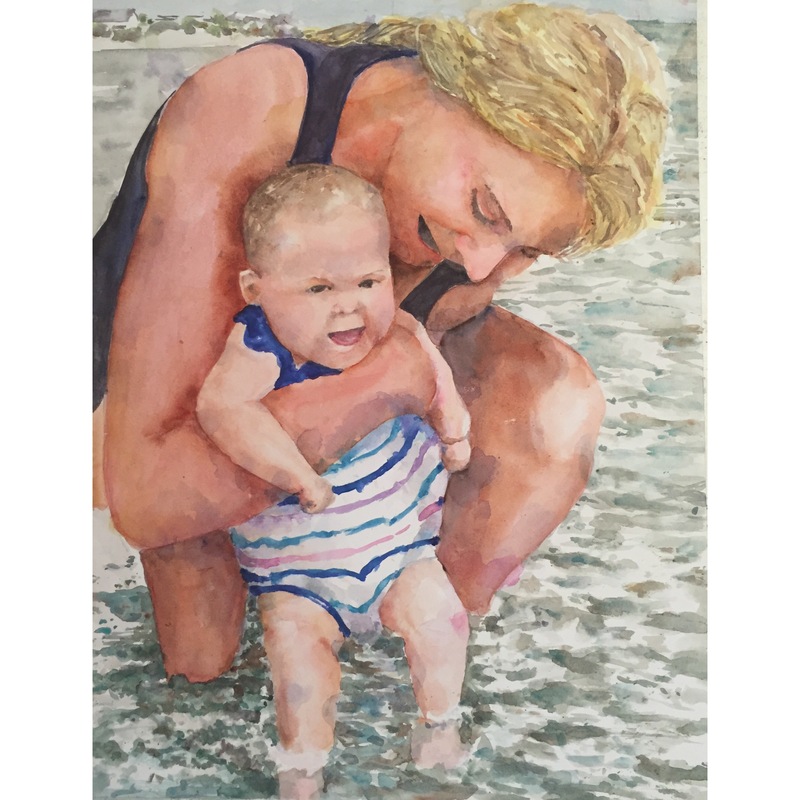 A large watercolor commission that it’s finally safe to share with you. Delivered on the 26th to the mom as a Christmas present. Oddly this picture looks best at a distance which is the way you view most paintings unless you are an art geek like me whose never happier than when she’s nose to nose with a Van Gogh or a Cezanne. There any place more magical? Even the city hall – the Hôtel de Ville – looks like a castle! The Metro stops all have grand signage which fascinated me. My favorite was the Art Deco ones in Pigalle. This was drawn quickly with a pentel brush pen. 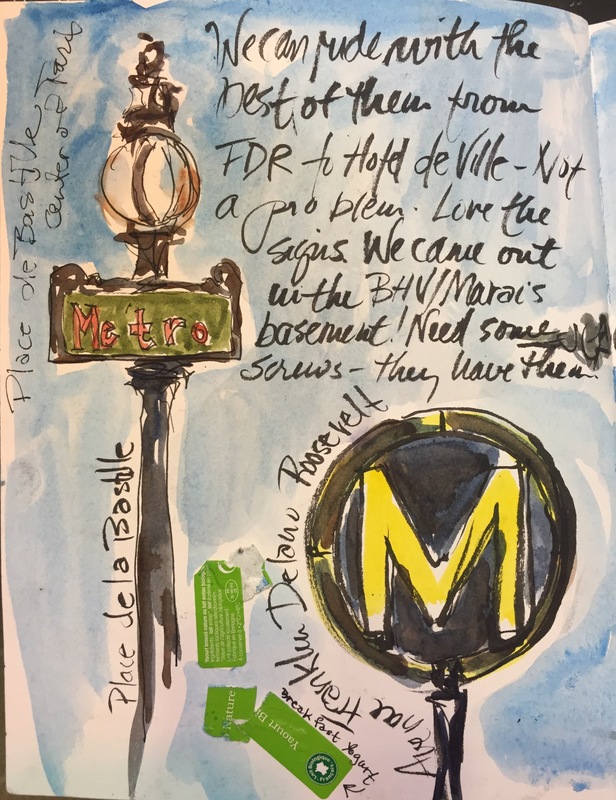 It overflowed onto my metro stop page. Painted w French ochre walls and Inathrodone on the black doors. The roof is a random gray that was on my palette. Aka leftovers. As I was painting this it reminded me of Ludwig Bemelman’s Madeline stories a childhood favorite of mine. Those books were the first time I remember hearing of Paris and France as a small child of five. I used to sit on the floor of my bedroom and read them. The drawing was actually from memory drawn the day we went there. The Metro is a little intimidating the first time you ride. It all moves so fast. Zip zip the train stops and started. Fully automated with nobody to ask questions. What if you end up in the wrong place. Our guide Christina explained it’s mysteries to us and after that we had no problems hopping on the metro. Oops except the one time we could not find the stop to get on it and ended up taking a pedicab backup to the boat. That was the day we walked nine miles so we were ready or at least I was!! We even asked a mounted police lady where it was and she told us two more miles! Bytw she was wrong! It was on the corner nearby. It just didn’t have the fancy signs we were used to looking for. Who knew they had plain signs too? 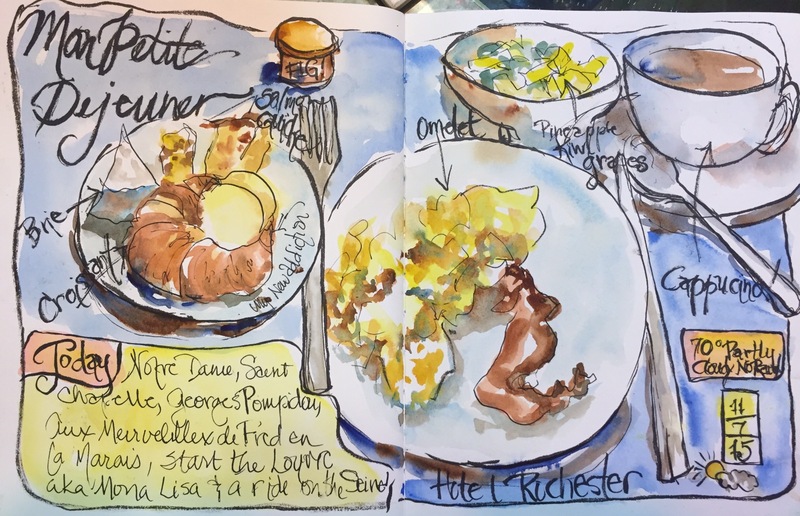 🇫🇷Or breakfast at the Rochester hotel. 🇫🇷If you didn’t like what they had you could order whatever you wanted. I always ordered an omelet. We were up so early I did’t want to get hungry before we found a place to eat lunch!! And of course since it was a buffet we tried lots of goodies-perhaps only a bite. 🇫🇷This lady sat next to me at breakfast one day. I knew she would not notice me drawing her since she was engrossed in her IPad. 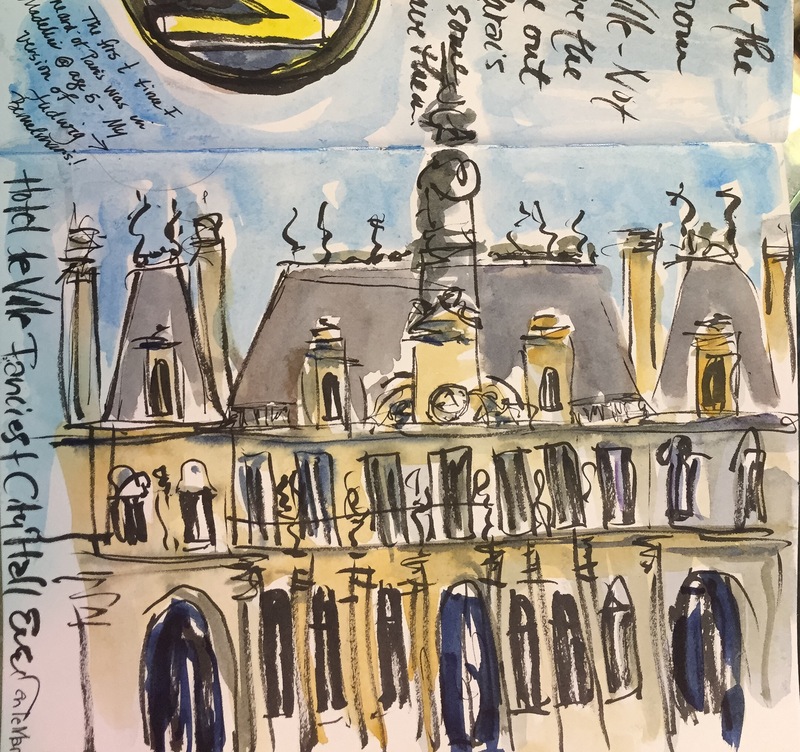 🇫🇷Strathmore mixed media 500 paper, Noodler Konrad pen, platinum carbon black ink, Daniel smith, winsor Newton, and Holbein watercolor. 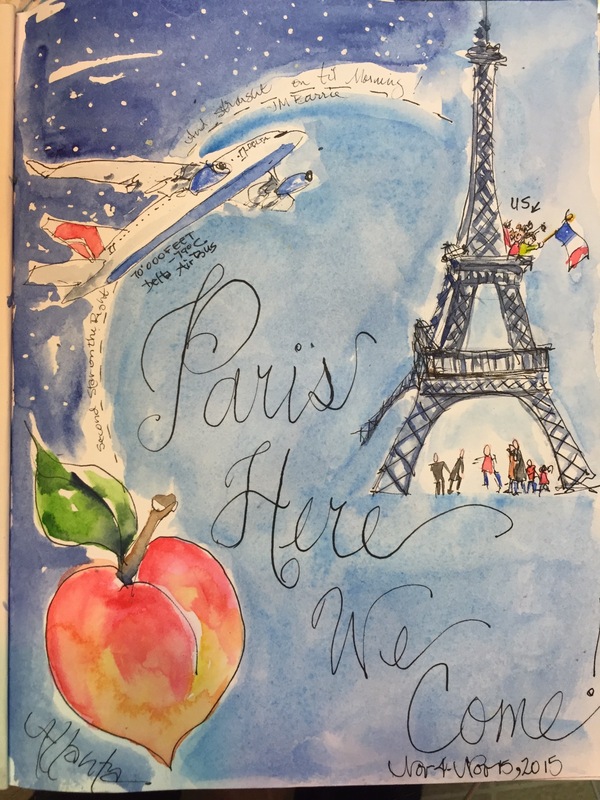 🇫🇷 I think I left my heart in France when it’s not in Decatur with my grandkids. 😢 I dream about it a lot!! 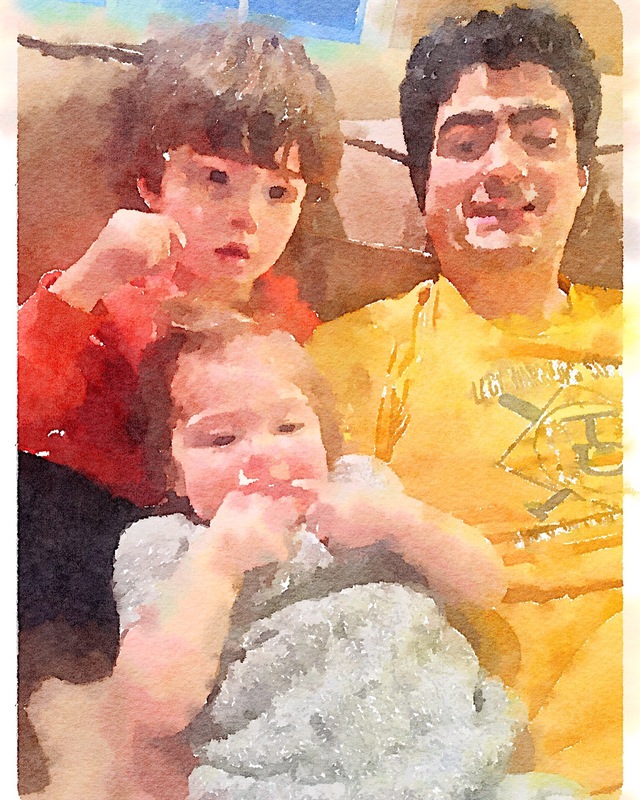 My youngest son and his two babies. Henry was totally absorbed in The Grinch. Livia was being cute saying cheese over and over while her dad laughed at her. Margaret who has to get back to Cooking dinner. No time for art on Christmas Eve!! 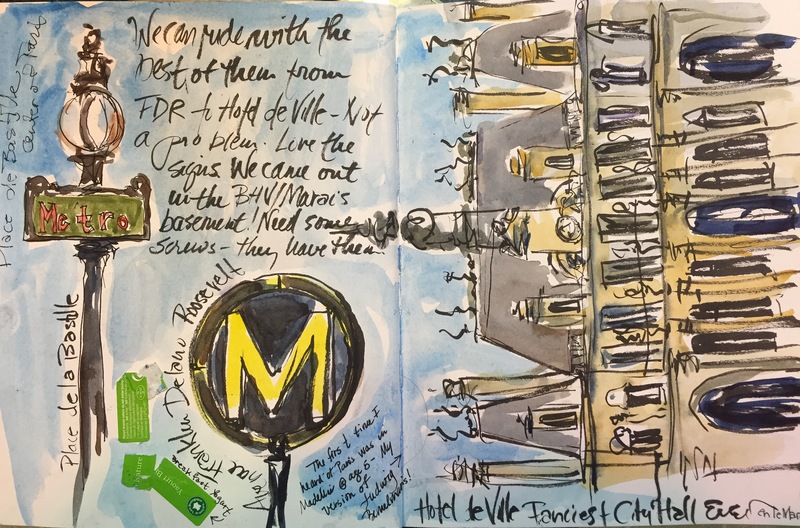 Paris Day 1 – Giddy with excitement. Like the layout. It evolved. The right page was done first sketched while we waited for our food. 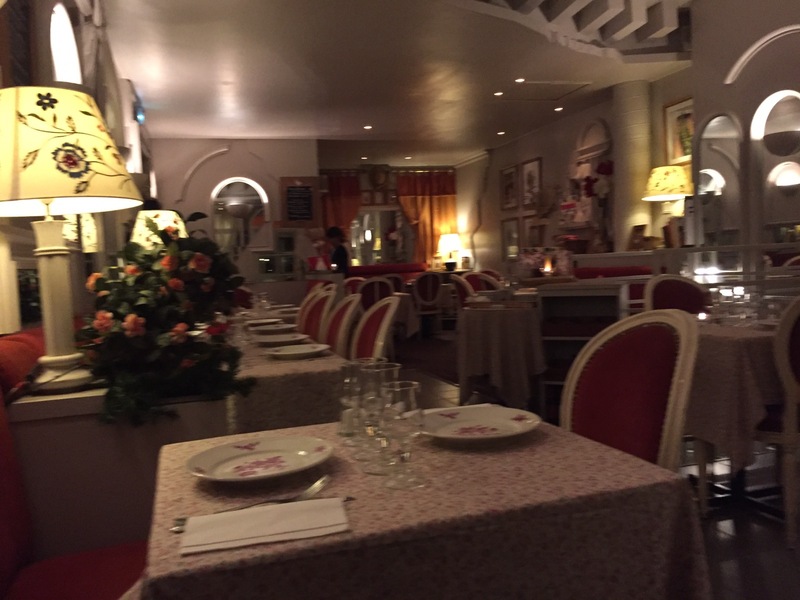 L’Artoise is a sweet little restaurant on Rue d’Artois around the corner from our hotel the Rochester. The Yelp reviews were spot on. Food was passable but not memorable. Debbie and Tucker also cruising on Viking and staying at the Rochester. The Proprietors were sweet and oh so French. The eggplant entree w a slab of store mozzarella was not great. The chicken an improvement – cow au vin I think. We were so excited that dog food would have been wonderful lol. We imagined we were Phil who we followed on his adventures on PBS What is Phil eating. A hoot. Phil would not have eaten at L’Artois. Dessert créme brûlée. Yummy. Then we walked the champs Elysees. I think we walked five miles even with out jet lag. 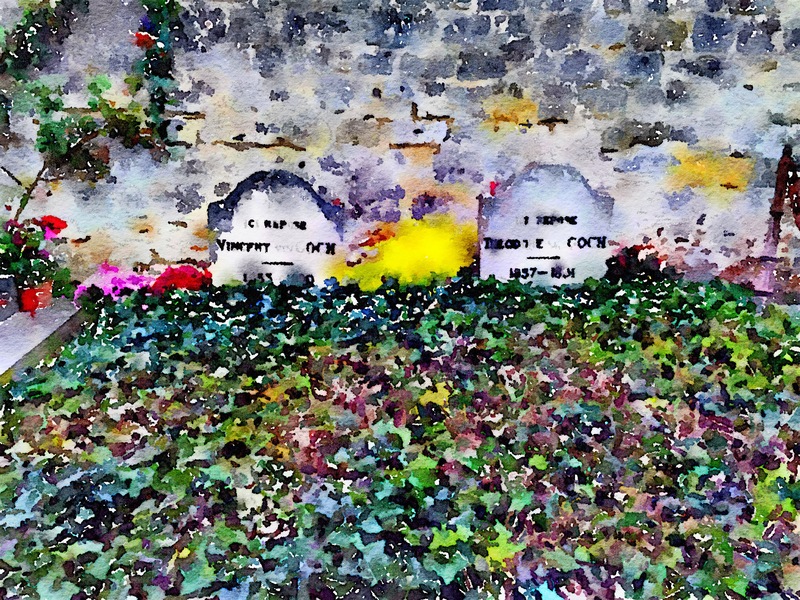 The graves of Vincent, 37 yr, and Theo Van Gogh, 33 yr, in the Auvers cemetery. Dead within six months of each other. Stars Benedict Cumbebatch and Vincent and James Parker the new Harry Potter as his brother Theo. Highly recommend this BBC documentary on his life based on his detailed letters to his brother Theo. So what’s great about it besides Benedict and James? The insites from his letters into how and why he painted as he did. If it’s not in the letters to his brother Theo it’s not in the video. He talks about why he chose his colors, his style and his subject matter. Watch it. It’s riveting if you love Van Gogh like I do! It was filmed on locations from his life. Interesting to me because I had been to some of them when we went to France like Montmartre in Paris and Auvers where he committed suicide and is buried with his younger brother Theo.